Looking to strengthen how domestic exhibition management handles giant panda science education, ensures healthy development for captive giant panda population, promotes efficient and orderly development for giant panda science education and cultural exchange, and raises public awareness on wildlife protection, the First Domestic Exhibition Management Exchange Conference on Giant Panda Science Education" was held in Chengdu, Sichuan Province from December 3rd to 6th thanks to strong support and leadership from the National Forestry and Grassland Administration, Sichuan Forestry and Grassland Administration, Chengdu Forestry and Landscape Administration, and Chengdu Research Base of Giant Panda Breeding. 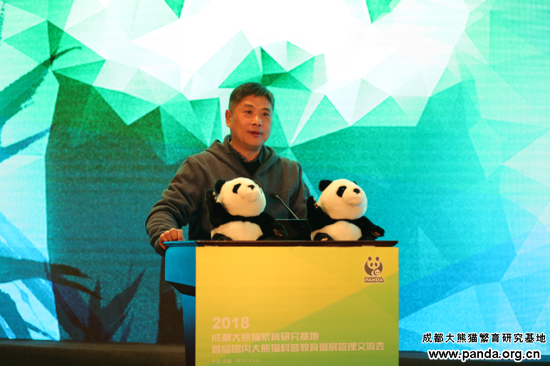 Wang Zhenzhan, Director of the Giant Panda Office of the Wildlife Conservation Division of the National Forestry and Grassland Administration, delivered a speech during the opening ceremony. Yang Xuyu, Director of the Protection and Management Station for Wildlife Resources Survey of the Sichuan Forestry and Grassland Administration; Luo Ye, Inspector of the Wildlife Conservation Division of Chengdu Forestry and Landscape Administration; Tan Hongming, Deputy Secretary of the Chengdu Research Base of Giant Panda Breeding; and other leaders attended the opening ceremony and delivered speeches. Zhang Jinguo, Deputy Secretary-General of the Chinese Association of Zoological Gardens; Bian Yongfeng, Deputy Director of the Tangshan Forestry Bureau; and Liu Jianxiong, Vice Chairman of the Chengdu Giant Panda Breeding Research Foundation, also attended attended the opening ceremony. About 120 representatives from more than 40 giant panda science education cooperative units in China were happy to attend and participate in the conference’s opening ceremony. Wang Zhenzhan pointed out in his speech that the giant panda has risen from a mere species to a cultural symbol with rich connotations. It is the best ambassador and symbol for wildlife protection, public science education, environmental protection, peace and friendship, and harmonious development. Since the captive giant panda population has expanded, China launched a domestic exhibition of giant panda science education back in 2005. Up until now, 73 breeding institutions for giant pandas in China have been established, and 151 giant panda science education exhibitions have been held. The state believes exhibitions for giant panda science education are important and have introduced a series of preferential policies. For the first time, this conference provided an extensive and interactive communication platform for various science education exhibition units, key to improving the exhibition management level of giant panda science education in China. It is hoped that all units will interact, exchange, and strengthen cooperation together to promote healthy and sustainable development for giant panda protection and science education. Yang Xuyu stated that Sichuan is the giant panda’s home. The number of captive and wild giant pandas, habitat area, number and area of nature reserves are the greatest in the country. Sichuan has raised 481 male pandas. The exhibition activities’ for giant panda science education aims its participants to firmly grasp the fundamental premise behind giant panda protection, highlight science education and cultural exchange functions; attach importance to the construction of software and hardware; refine management methods; and improve technical guidance. They want to work together to promote orderly development of exhibition management for giant panda science education. 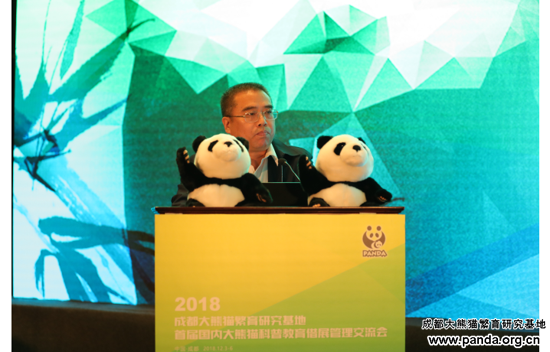 Luo Ye said that smooth development of exhibition management for giant panda science education is quintessential to the care and support of competent authorities at all levels and cooperative efforts. Exhibitions on giant panda science education is our long-term undertaking. These exhibitions can still be further explored and improved. I hope that everyone will share their experiences and technologies, exchange ideas, and improve this conference together. We need to give full play to the unique role of the flagship species in science education and promote giant panda science education to an all new level. Tan Hongming, Deputy Secretary of the Panda Base, representing the organizer, extended a warm welcome to all leaders and delegates that attended the conference. 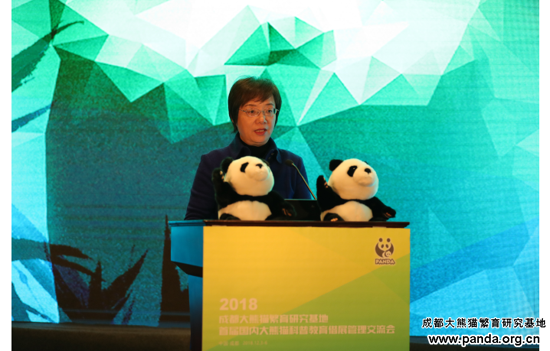 He said that the Panda Base has been holding domestic exhibitions on giant panda science education according to the relevant requirements from the National Forestry and Grassland Administration. As of December 2018, 29 cooperative units participated in the development of giant panda science education activities at the Panda Base, and 60 giant panda exhibitions. The base believes exhibitions on science education are of the utmost importance and has long provided the popular science education cooperation units with relevant experience, technology, materials, information, and expert guidance of giant pandas in any way they can. This has greatly improved giant pandas’ welfare. 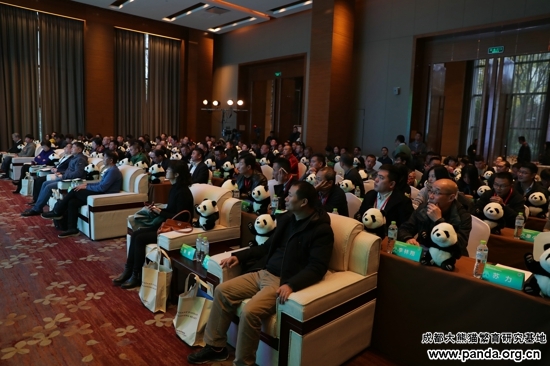 I hope that conferences like these can be held regularly, and everyone will contribute to domestic exhibitions on giant panda science education. Chengdu Research Base of Giant Panda Breeding held the conference, and relevant government agencies at all levels were concerned with its outcome. It is important because it is the first exchange conference with the theme Exhibition Management for Giant Panda Science Education that explored how to innovate exhibition management for wildlife science education. 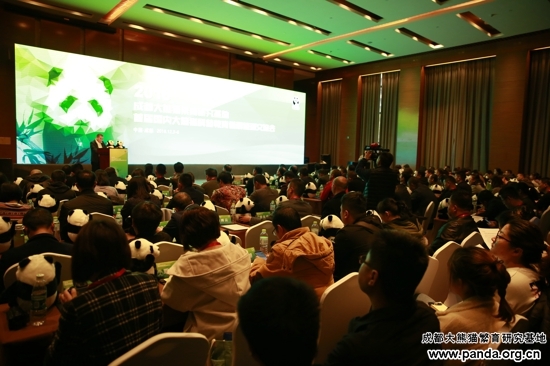 At the conference, representatives of management agencies and science education exhibition units, and experts from all walks of life gathered together to discuss and deliberate on giant panda breeding management technology, science education, disease prevention, and daily health care for giant pandas, and environmental enrichment. The conference’s success will promote further development into China's endangered wildlife protection and ecological protection, and promote China's giant panda science education to a new level. 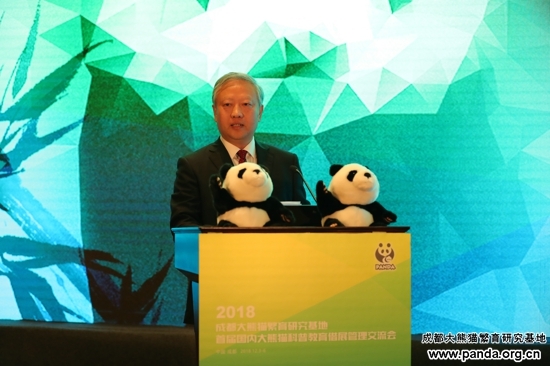 Wang Zhenzhan, Director of the Giant Panda Office of the Wildlife Conservation Division of the National Forestry and Grassland Administration, delivers a speech. Yang Xuyu, Director of the Protection and Management Station for Wildlife Resources Survey of the Sichuan Forestry and Grassland Administration, delivers a speech. Luo Ye, Inspector of the Wildlife Conservation Division of Chengdu Forestry and Landscape Administration, delivers a speech. Tan Hongming, Deputy Secretary of the Chengdu Research Base of Giant Panda Breeding, delivers a speech.